Verify that your computer is running Windows 7, 8, 8.1 or 10. IMPORTANT: For best results with the Propeller C Tutorials, accept all defaults including driver installation. Restart your computer once the installation has completed, before connecting your board. For version information, click here. Allow SimpleIDE to create a workspace (if prompted). 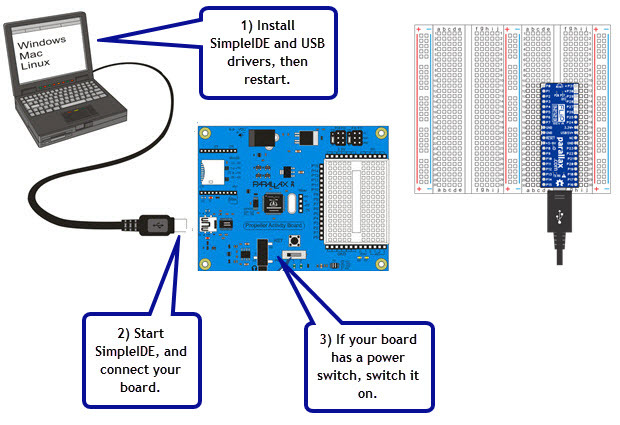 Connect your Propeller Activity Board or other Propeller board to your computer's USB port with a USB A to Mini-B cable or USB A to Micro-B cable. Wait for your computer to detect and display a COM port for your board (upper right corner of SimpleIDE window). If your Propeller board is not USB-powered, connect a power supply now. If your Propeller board has a power switch, turn it on. 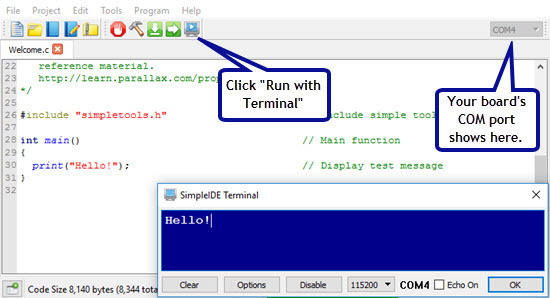 Click the Run with Terminal button, and verify that the "Hello!" message appears. You should update your Learn folder to ensure you're using the most up-to-date libraries and code. Please go to Update Your Learn Folder for instructions on how to update. Need help? Email support@parallax.com, visit the Learn Forum, or call Tech Support at 888-997-8267. Found a bug? Please report it to the SimpleIDE Open Source Project site's Issues page.